With 700 seats, the Kino 10 of CinemaxX Mannheim is among the largest cinemas in Baden-Württemberg – with almost 280 square metres the screen is definitely the largest. 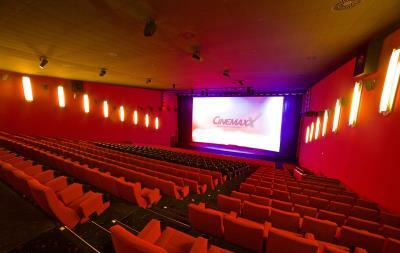 The Filmtheaterbetriebe Spickert Entertainment GmbH, the operator of the CinemaxX, already chose, with the Cinemarray pro-ribbon system in 2012, for a sound system of the Dutch premium manufacturer Alcons. With the conversion to Dolby Atmos, the leading 3D Sound solution for immersive sound experiences in the cinema, an extension of the sound system was recently carried out. The original sound system comprised three Alcons CRA30n and three Alcons CRA30w 3-way Cinemarray Pro-Ribbon screen sound systems, assembled in three stacks (L, C, R) of one CRA30w and CRA30n each; LFE was taken care of by four Alcons CB362 (2x 18”) high-output subwoofers. For the surround-sound 24 units Alcons CRS8 2-way pro-ribbon surround systems were installed. Three Alcons ALC2 2x 1kW and eight Alcons ALC4 2x 2kW Amplified-Loudspeaker Controllers – each with on-board SDP processor modules – drive and control the system. „With the Alcons sound system, we have created in our Kino 10 one of the most modern cinemas in Europe. The professionalism and quality of Alcons has convinced us from the start, "explains Frank Noreiks, CEO of Filmtheaterbetriebe Spickert Entertainment GmbH. As part of the Atmos upgrade, numerous Alcons systems have now been added again. The surround system was expanded with two CB211SL 21” shallow subwoofers, two pro-ribbon CRS12GT (12” LF + 6” pro-ribbon), 14 pro-ribbon CRS12 (12” LF + 4” pro-ribbon) as well as six CCS12 and ten CCS8 (coaxial) surround speakers. Nine Sentinel3 4-channel amplified loudspeaker controllers with 36 channels, were also added to control and drive the system. The speaker systems have been installed as top surrounds and wall surrounds, according to the Dolby-calculated design. This makes the CinemaxX Mannheim currently the only cinema with Atmos technology on this side of the Rhine in the Rhine-Neckar region. With this upgrade, the operator of CinemaxX is responding to the increased expectations of moviegoers. Digitization also entered the cinema world and set a wave of technological evolutions in motion, facing theater operators with entirely new challenges. The modern, high-resolution media put strict requirements on the production chain in general and the performance of the theater speakers in particular. Complex sound impressions should be reproduced with the finest details at full dynamics - everywhere and in every conceivable application. The unique Alcons pro-ribbon mid- high frequency transducers reproduce the original sound of a movie without signal summation, coloration or distortion of sound. And that in really any system size. Frank Noreiks: "Today moviegoers specifically look for upgraded cinemas. To that extent the conversion to the latest technologies offers us a clear competitive advantage. Dolby Atmos for us is the logical development of the already existing Dolby systems in our cinemas such as Dolby 7.1", Noreiks continues. "The addition of additional audio channels creats an even more realistic sound experience for the viewer. It is noteworthy that it’s not about increasing the sound pressure level, but perfecting the sound experience to a higher resolution. " Both for the initial and the subsequent installation of the loudspeakers Fours GmbH from Heidelberg was commissioned, under the project and installation management of Florian Iser. On 13 July 2016, the CinemaxX finally celebrated the premiere of the new sound system with "Independence Day: Resurgence". Kino 10 is thus today one of the largest Dolby Atmos cinemas in Europe! To do justice to its pioneering role and to make the movie experience even more immersive, the CinemaxX Mannheim went even one step further and installed "Thunder Seats, with which a woofer integrated into the cinema seat makes the movie experience even more intense and direct. Finally noticed Noreiks: "Our Kino 10 is a cinema of the future - more cinema is not possible! With Alcons, we have the most competent partner on our side to make cinema as progressive as possible. "